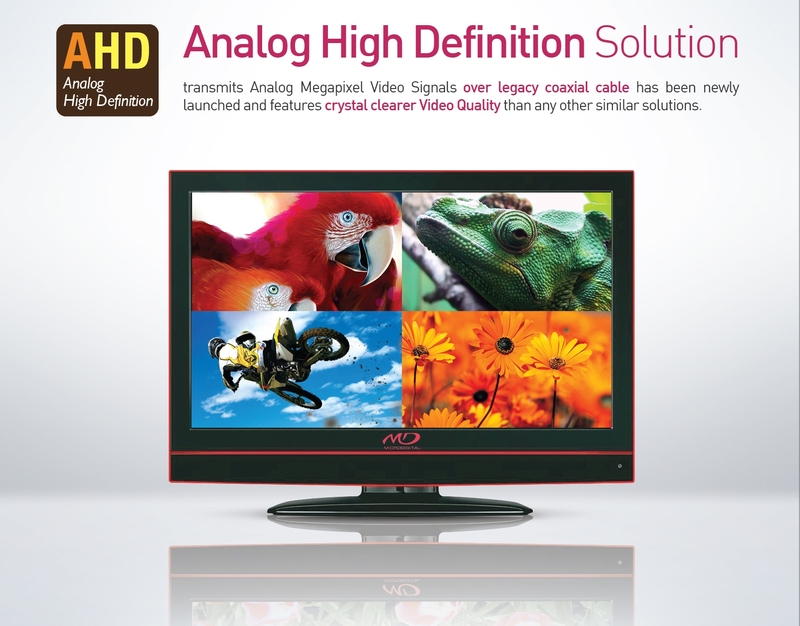 MD AHD 1.0(720p) / 2.0(1080p) System, which transmits Analog Megapixel Video Signals over legacy coaxial cable and is based on proven & robust technology, features crystal clearer Video Quality than any other similar solutions and is suitable for diverse applications. Ideally, AHD 1.0 System can replace all Analog products completely with Backward Interoperability to 960H& 760H Video and AHD 2.0 System can do up to mid scale IP-Based System with Cost Effectiveness and Low Complexity. Backward Interoperability with legacy Analog System, UTC(Up-the-Coax) for Motorized Zoom Control and OSD Settings, and Noiseless run 3C2V Cable over up to 500m are synonymous with AHD System and are also Unique Selling Proposition. AHD is the right choice for new HD Video deployment and HD Video Upgrade in a legacy infra-structure. By using Double Scan Technology composed of long shutter and short shutter system, WDR(Wide Dynamic Range) Camera enables users to get the contrast image against strong backlight. In this option, users get the foreground scene brighter to recognize the object more clearly and the background scene without over-exposure. Digital WDR adjusts the contrast on the screen by compensating for bright and dark spots digitally. It is based on single scan so that the contrast couldn't be stronger than WDR above. BLC (Back Light Compensation) based on single scan only guarantees the foreground scene brighter while the background scene is saturated by over-exposure. It reproduces noiseless images and users can drastically save the volume of storage media and HDD capacity in DVR. 2D DNR doesn't make motion blur but produces less effective noise reduction rate and blurred edges on the objects. Meanwhile, 3D DNR features very effective noise reduction rate but produces motion blur when an object is moving in low light condition. It allows the Camera to improve the sensitivity in the darkness and also extends the IR visible ranges by settings. Users should set up a good balance between the sensitivity improvement and no blurred image. It maintains the image in clarity under poor weather conditions like snow, rain, smog and fog by enhancing the video signal on the edge of objects. Unlike low cost cameras with fixed Iris lens and only 2.8-12mm varifocal lens, MD Night Vision cameras offer diverse surveillance applications with 3.5-16mm (4.6x) and 6-50mm (8.3x) DC Auto Iris lens as well as 2.8-12mm (4.3x) DC Auto Iris lens to cover Short, Mid, and Long Range Night Vision. Furthermore, in case of 30x Full HD Speed Dome Camera, the IR Visible Range is up to 150m and the brightness of the IR beam is synchronized with field of view of the lens for the optimal video surveillance. When the object gets closer to the Camera at nighttime, the image becomes over saturated due to the strong ray of IR LEDs. The Smart IR Technology prevents IR over saturation and guarantees clear images. This Technology is included in all MD IR AHD Cameras. While AHD 1.0 system offers UTC feature in CVBS mode only, Users can configure Motorized Zoom Control and OSD Settings in MD AHD 2.0 System through DVR. It's a value added feature without budget products in the market. The more resolution, the more difficulties in bringing the Camera into focus. One Touch Focus technology works like Auto Focus and enables users to adjust the focus of the Camera remotely on web interface, NVRs, and VMS in a few seconds. It offers a value added solution by reducing the installation cost and is adapted to All-in-One Camera, IR Bullets, Indoor IR Domes, and Outdoor IR Domes. MD Weatherproof Cameras passed official IR 66 rated test provide a perfect solution for moisture leakage problem against any harsh weather condition. The Cameras are completely sealed not to smear water or moisture into the Camera and a Desiccant Sticker inside helps prevent moisture under the severely changing weather condition. It gives a proper solution against extreme low temperature environments and guarantees the operational temperature of the Camera in -10℃ ~ 50℃. Conventional Cameras get frozen when the temperature outside comes down below -10℃ such as in polar regions, at cold winter season or in a place of cold-freezer container resulting in ice stuck on the lens glass or even out of operation. The heater starts warming at the temperature inside the camera comes down below 5℃ and automatically switches off when the camera is heated over 15℃.